Accelerated schedule seems to be the buzzword this weekend. This live blog is sponsored by Doppler Radar, as @curtcavin just tweeted that Barnhart is calling for rain by 9:30. What a total salad this weekend has been so far, with one hour of practice time in the afternoon topped by Scott Dixon. Surprises included Mario Moraes (on top of the board for a while), Ed Carpenter and Sarah Fisher, who was pretty comfortable around P10 for much of the session. Beer of the race is Berkshire Brewing Co.'s Traditional Pale Ale. Fresh and bold with a hint of hoppiness, and a deep copper color. As Pressdog said yesterday, everything is better with beer. The big question today is not whether a Penske or Target car will win, but will the race finish at all. Sir Jackie Stewart is in attendance, many years hearing him call the I500 on Wide World of Sports brings back memories. Hopefully Sir Jackie also brought the oval intermediate tires. Terry Angstadt talks about series value. Uhh, explain it to New Hampshire, Terry. Somewhere TG is chuckling. oof...Dario backed off and the start is scratched...right pedal, Dario! Lap 10 - Commercial break - Dixon, Dario, Briscoe, Helio, Danica, Moraes. Those who Apex and Izod in the first commercials take a drink. Lap 26 - Danica is holding up Marco again. "DAAAAAAAAAAAAADDDDDDDDDD"
Lap 32 - Ed and Mario are dicing for fourth. Those P2P thumbs are starting to get sore. Lap 41 - Dixon is walking, with Briscoe and Helio in tow. Nice commercial with more of Radio Birdman's New Race. Whoever picked that song for VS should get a free case of Berkshire. Lap 50 - Moraes and Conway t-boning in pit lane. Surprised? Didn't think so. Lap 55 - Dixon is on cruise control. Saving fuel. Lap 65 - Dixon .32 over Briscoe, Eddie C another second behind in third. Apex Brazil needs to update their commercials with the Torch, TK. Lap 72 - Dixon marches on, still no yellows. No more predictions, but we should have an official race in about 10 minutes at this pace. Lap 82 - Wilson down a lap. Ed, Helio and TK have to remain within striking distance of the leaders, as they are a couple seconds back. Lap 86 - The Penske boys are saving fuel according to Sir Jackie. Power and Briscoe can't find the P2P button, or haven't needed it yet. Banzai charge later? Lap 99 - Team with the best weatherman wins? That counts out AGR. Lap 104 - Second round of pit stops, as Dixon peels off the sidepod of Briscoe for ethanol replenishment. Lap 107 - Briscoe and Dixon in front after the cycling of stops, followed by Eddie C and the Torch. Lap 114 - Doornbos out. Somehow Conway is still in the race, -8 laps. Why do I have a feeling that might be a problem at some point? Lap 122 - Yellow for some reason. Hope it's not moisture. Wilson slow on track. Phew. Everybody brought their A game. Lap 124 - Mutoh and Power stay out. Maybe they know where the storm is? Lap 127 - Green green green Dixon jumps the restart and drops back Carpenter sets off after Power, TK in there as well. Briscoe with a BIG tankslapper. Lap 133 - Just checked the weather, 94% humidity, barometer falling. Ed might want to think about taking the lead now. It's coming. Lap 140 - When was the last time we saw two YELLOW cars fighting for the lead? Maybe 1989? Lap 144 - Ed takes the lead at the line. .02 seconds between he and Power. Some sore thumbs at the moment, no doubt! Lap 151 - Lindy says Power due in Lap 155. Everybody else was Lap 123. Where's that weather update? Lap 158 - Eddie Carpenter out in front. IM from Ianucci "No Ganassi car in Top 5, check for swarm of locusts" I'm sure Chip is dispatching someone under the track with a two liter bottle of H2O. Lap 167 - Eddie leads Helio. Wonder what Ed's victory celebration is? Dixon fading, Dario up there. Final stops looming. Lap 170 - Tweet from @jpmontoya - he's watching the race. He should be here, in a car. Back in plenty of time for Pocono. Lap 175 - The Vision boys NAIL the pit stop. Nice work, makes it count. TK right there too. Lap 179 - Green stops cycling. Looks like we will get a full 200 laps. Eddie C first, followed by TK. Lap 181 - @visionracing tweeting up a storm. Ed has paid his dues, he's deserving. Lots of late nights in dirt at place like Whip City on the way up. Lap 185 - Eddie and Tony. Great point by Beekhuis on strategy for the finish. Lap 191 - Eddie fighting it out with Briscoe, swing low, sweet chariot. Lap 199 - Ed, you better hit that freakin' button NOW! Lap 200 - Briscoe by a nose. The Evil Empire triumphs. Ed C second, followed by TK, Helio, Graham, Dario and Dixon. Shake up in the points again. Seventh-closest finish in series history. Great race - I ran out of beer before the last pit stops and I didn't want to go downstairs for the next bottle! Thanks everyone! Keeps taking me a minute to realize "Eddie C." isn't Eddie Cheever. are we still drinking for "tools"
@James - Yeah, I almost forgot Eddie Cheever drove for Foyt. To be in those post-race meetings. so if that's all they had to do (a few aero changes) to get racing like this--why in the world didn't they do it sooner? Best race of the year! Major props to whoever thought of those rule changes. Get 'em next time, Ed! I was skeptical as hell about the push-to-pass changes. Let's just call it a "strategic boost" or something from now on, OK? I felt like it was that kind of gimmickery that was the last flatulent release of gases from the decomposing corpse of Champ Car, but man, oh man, did that work tonight for the IRL or what? And the optional areo changes -- simple, bolt-on pieces that you can throw in the hauler to have just in case... This is so smart, a brilliant call by the authorities. A set of bits you can use if you want, or not if you don't think you need 'em. It's such a simple level of variability, but it's visible, it's something to talk about and debate, something to use in your race strategy. And they finally managed to come up with some aero package changes and variability that _doesn't_ appear to unnecessarily endanger driver safety, which has been a real challenge in the open wheel series in the last 10-15 years. The auto racing series that by all accounts ought to be producing the best racing on the planet delivered, finally. A great call, a great race, and a great result. Congrats to Ed Carpenter for posting a vindicating result, and great work Ryan Briscoe for a long, hard-fought, breathtaking end of the race. I'm raving. Awesome. It was one of the best races to be in the seats watching. The impending rain just added to the fun. About 40 minutes before the pre-race, it was sprinkling pretty good but during the race there were just a few drops here and there - just enough to make it interesting. Lots of rooting in the stands for Ed to win. The helicopter "fly by" at the beginning of the race is worth noting -- it rounded the track three times flying in three different ways right over the stands. Kentucky is a great venue even though it took three hours to get out of the track and to our hotel 30 miles away. I guess it is because the attendance was great and everyone stayed until the end of the race. lilly, next year, park behind turn 2. That's always the quickest area to get out of. I see the diss on Sarah: "Lap 23 - Sarah is going in the wrong direction; back into Milka/Jaques Lazier land (P21)." Interesting how she went backward to P21 when she started P22. Remind me where Sarah finished again? I’ve been wondering about the oval situation – Milwaukee with a new promoter now has over a year to at least try to claw back at least some of its dented finances. 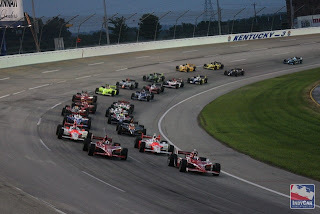 With the 100th anniversary of the Indy 500 taking place in 2011, do you see a potential return to the series for the circuit to try and re-establish the race just after Indy or could it do better in a different time of year? Lastly, are there any *good* oval tracks that are not under the jurisdiction of ISC, that happen to be in an area where the IRL has a growing or healthy fanbase and that may be interested in having a race, that may be willing to stump up the sanctioning fee – or am I asking for a little too much? That race was more like it. First time in a looong time I actually squirmed in my seat, spilled an adult beverage and screamed at the set, simultaneously, rooting for EC. Kudos to all. Let's keep the momentum rolling to the next oval venue.